The December 2007 issue of Saveur magazine, had a phenomenal article on roasting various meats. Since then, I've been using their techniques and putting all kinds of variations and my own creative stamp on dishes. If you can get your hands on this back-issue I recommend it for anyone who wants to learn the fundamental perfection techniques for roasting pork, beef, chicken or fish. 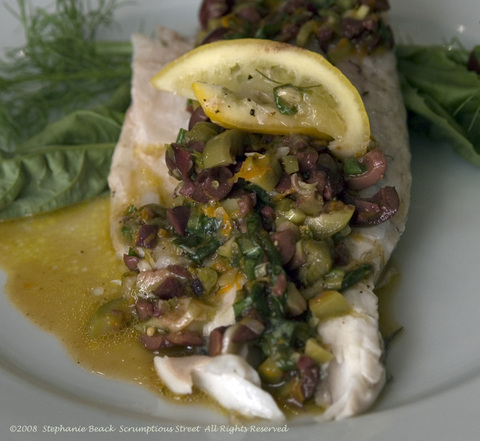 My favorite dish which grew out of this fun experimentation is my "Roasted Branzino with Tangelo-Olive Tapenade." My techniques are the same as the segment of the article on "Striped Bass with Salsa Verde" but the ingredients I used are different and my own style. That's the beauty of great articles or recipes, they inspire you to create something all your own! The best thing the fish segment taught me is how to solve a problem I've had roasting whole fish. In roasting, you don't want the protein to be lying in the pan or juices, otherwise you're braising or steaming and the texture and flavors are different. Roasting proteins, on the bone, brings out the maximum flavor while preserving the moisture of the flesh. With chicken, poultry or beef you can use a roasting rack to hold the meat off the bottom of the pan so the heat is completely dry. With fish, however, the skin will stick to the rack and pull off when you remove it. Even using aluminum foil with non-stick spray has undesired side effects. This article showed how to make a "roasting rack" for the fish using ribs of celery. Genius! So simple, as genius often is, and it makes all the difference in the world. The fish roasts perfectly, entire body intact, until you're ready to fillet it elegantly at table-side. Here's what my branzino looked like prior to roasting. The photo shows several techniques - the bed of celery as a rack, scoring the fish and tucking thin slices of lemon into the slits and stuffing the cavity with aromatics. All of these are key techniques to a succulent and flavorful whole fish. 1. In a small non-reactive bowl, mix together all the ingredients listed for the tapenade. Taste to ensure you've got good balance of flavors. If you can make this a day in advance, all the better. If not, make it as early as possible before you're ready to roast the fish. Its taste improves the longer it sits within 24 hours (no more). 2. Pre-heat oven to 400˚F. Unwrap the fish on a cutting board and cut two or three angled crosswise slits on each side, which go about halfway to the bone. (This is called scoring.) Rub the fish with 2 T. extra virgin olive oil on the inside and out of both sides. Season with sea salt and pepper on the inside and out, covering lightly but uniformly. Tuck one lemon half-moon into each of the slits you scored in the fish. Put the remaining slices and the basil stems, tarragon stems and fennel fronds into the belly cavity of the fish. 3. Grease a baking sheet with 1 T. olive oil. Arrange the celery ribs to make a rack for the fish, using in both horizontal and vertical fashion. I cut my third celery rib in half and placed one each under the head and the tail. Drizzle 2 more tablespoons of olive oil on the celery. Place the fish on top of the celery-rack making sure none of its body is lying on the baking sheet directly. 4. Place the fish on the baking sheet in the oven, uncovered, and roast for 18-20 minutes until the skin is crispy and the flesh feels tender but still slightly firm. You can use a fork to peel back a little of the skin at the tail and see if the flesh flakes, if you're uncertain. 5. Remove from oven and carve immediately. Properly carving a fish is best done visually rather than verbally. Luckily, Saveur thought of that too! Don't worry, it just takes a little practice! Serve with the olive-tangelo tapenade and enjoy! Once you get the concepts down, try all kinds of fish and aromatics and you'll be having delicious roasted fish with ease. 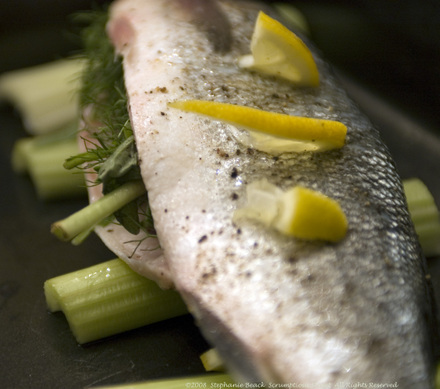 For more ideas on how to use Branzino, check this out. Continuing my celebration of peak citrus season, I've recently been working on perfecting a Key Lime tart or pie recipe. I made this a few weeks ago with a pre-made curd and while it was good, it just wasn't blog-worthy until I got a fully homemade version ready. Well, here it is, folks. 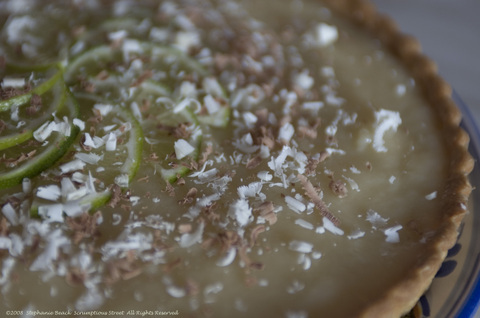 My "Key Lime and White Chocolate Tart". Both filling and crust are a variation on other people's recipes, which is quite rare in my kitchen but I'm thrilled with the results nevertheless. The addition of white chocolate is all mine and I really love the way it turns out. The white chocolate cuts the edge off the tartness without making it sweet. If you go for a high quality product, it adds a velvety texture and subtler flavor that is more pleasing at the end of a meal and goes well with dessert wine or coffee. I served it last night at a dinner party I catered (yes!!) and it got rave reviews all around. My suggestions on brands are in the recipe links below. The curd is a recipe derived from Chez Panisse Fruit by Alice Waters, but I found it on one of my favorite websites. The crust is the same Cream Cheese Pastry adapted from Mitchell Davis that I used recently on my pot pies. 1. Prepare and bake a pie or tart crust according to recipe and blind-bake. Allow crust to cool completely before continuing. 3. In a large saucepan combine the sugar, cornstarch, salt and water with a whisk. Turn the heat on to medium and bring to a gentle simmer whisking occasionally at the beginning. As the curd thickens, whisk more constantly. 4. In a second smaller saucepan, add the white chocolate and melt gently on low while the curd is thickening. Whisk during the melting process. 5. When the barely simmering curd is thick and translucent, whisk in egg yolks, 2 at a time very quickly. Make sure not to cook higher than a simmer here, otherwise you'd need to temper your eggs to ensure they don't curdle the filling. 6. Quickly whisk in zest, juice and combine. Then whisk in the butter. 7. Bring curd to a good simmer, whisking constantly. Lastly, slowly pour the melted white chocolate into the lime curd and whisk to incorporate. 8. Immediately remove from heat, and pour into your crust. Bake at 350˚ for 15 minutes. Remove from oven and let cool slightly. 10. After tart is thoroughly set, bring it out of the fridge 15 minutes before serving to come to room temperature. Garnish with lime zest, chocolate shavings and serve! 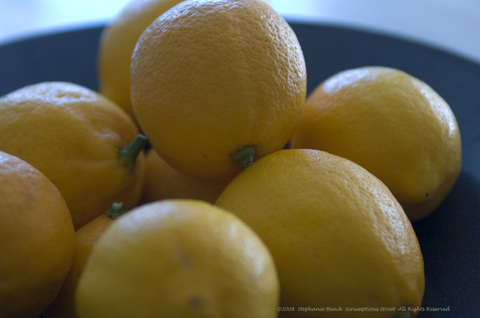 As I mentioned yesterday, I recently found some fantastic Meyer Lemons from a local orchard here in Northern California. They've been endlessly inspiring, as well as delicious, and I fear that I've acquired a new food-addiction. The lemons flavor is so wonderfully bright and sweet-tart that I'm using them all over the place. This dish I created showcases their best flavors and textures in one healthy meal. 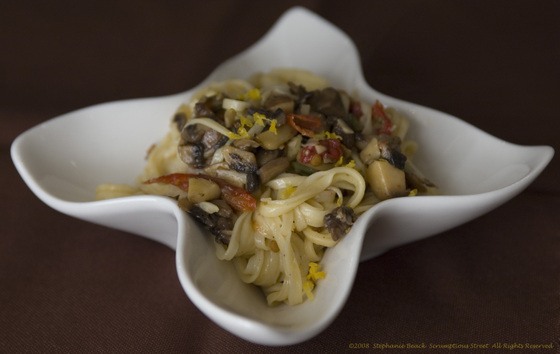 It's my "Meyer Lemon Fresh Linguine with Sun-Dried Tomatoes and Wild Mushrooms." Last year, I did a post on my first-ever homemade pasta. It was great, but I have to admit that this time surpassed my first round. I've gotten better at forming, kneading and rolling out the dough so that this pasta was toothsome but so very delicate. 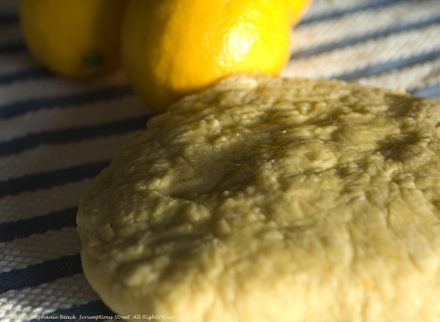 The Meyer Lemon add incredible depth and freshness; if it weren't so much work I'd make it once a week. Alas, this is one dish that is honestly TRULY worth the effort. For the pasta dough, I again used Mario Battali's recipe and added the Meyer Lemon Zest straight to the eggs in the well before mixing into the dough. It worked perfectly. The dough was very supple this time so I think I also got better with my hand-mixing and kneading. My goal on the condiment for the pasta was to show-off the Meyer Lemon and pull in flavors that were still "Winter" in heartiness but light enough to not completely cloak the taste of the lemon. I definitely succeeded! 1. Prepare the pasta dough completely per recipe and instructions from Chef Batali. This time, I did all the mixing and kneading by hand instead of my Kitchen Aid. I only used that to roll and cut the dough. It worked great! 2. Bring a large pasta pot full of water to a boil and salt generously. Do not add the pasta until the sauce is nearly done since the pasta will only take about 2 minutes to cook. 3. Heat a large skillet over medium heat and add the olive oil. When hot, add the anchovy paste to the pan and melt it gently. Add the sun-dried tomatoes and red hot pepper. 4. Add the garlic, salt and pepper to taste. Saute until the garlic is light brown. Turn down the heat to low and add the mushrooms. Sweat them about 2 minutes until they start to soften then turn heat back to medium-high and sauté about 4-6 minutes more. 5. Gently put the linguine in the boiling water when the mushrooms are about 2 minutes from being done. When done, drain the pasta and add directly to the skillet and add 1 T. pasta water. 6. Pour or squeeze the Meyer Lemon juice over the pasta and condiments in the skillet and toss very gently with tongs. Incorporate all ingredients. 7. Remove the skillet from heat and serve the linguine. Garnish with Asiago cheese and eat immediately! After the paste is made, this is really very simple to make. It's also spectacular. If you don't want to make your own pasta, there are plenty of fresh varieties in most gourmet stores. Just make sure to go for fresh with this dish and look for one that has lemon or another bright flavor such as herbs. Enjoy! 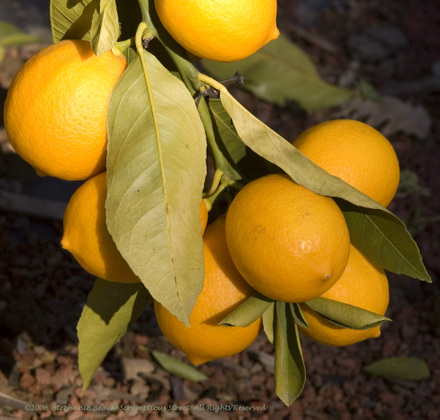 One of the greatest agricultural joys for me in Winter in the U.S. is Meyer Lemons. Citrus are really at their peak here in the months of December through March and I've enjoyed that in my cooking for years. Now, however, I'm positively thrilled because I am in the hotbed of California citrus! One of my absolute favorites are these special hybrids that originated in China and are a cross between a lemon and a Mandarin Orange. Their juice is still tart but much fuller and a little sweeter than common Eureka lemons. The skins become a positively heavenly zest that is delicate and less pungent but still has a tangy tartness. 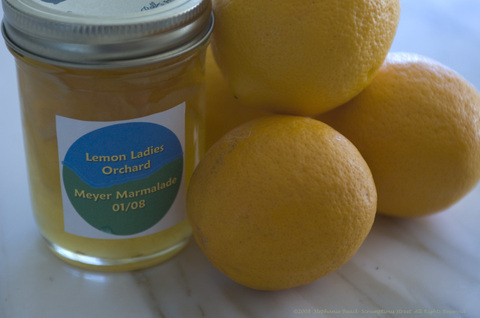 I recently discovered a wonderful Meyer Lemon orchard that is within a 20-minute drive from my home. Lemon Ladies Orchard is a real gem, and Karen Morss, the Orchardess is absolutely delightful as well as being devoted to growing the highest quality Meyer Lemons I've ever seen. 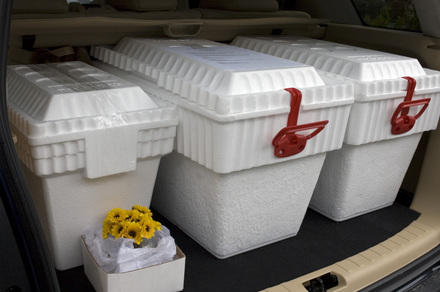 She ships everywhere and supplies many of the Bay Area's finest restaurants with their stash. A great note about her orchard -- each of the trees in named after a fabulous woman who has inspired or motivated her throughout the years and hand-painted tiles in each woman's name honor their place in her life. Karen has been picking off the blossoms on the trees since she started in 2004 so they'd be strong, stable and lush. This is her first year's full yield. And, wow, are they stunning and delicious. Stay tuned for my recipes based on these little golden treats and meanwhile, find some for yourself so you're ready to cook along with me! While I'm no hard-core Locavore, my move to California has seriously inspired me to eat as much as possible from within my county, or at least the state. Let me tell you, it is so much easier to do this in the middle of winter in California instead of New York! I am in the heart of agricultural paradise and having a great time experimenting! My appreciation is growing every week for the beautiful produce, crops and creatures raised or harvested nearby. And for the farmers who grow them! This dish is a great example of what I'm talking about here and what I'm making in my Scrumptious kitchen. 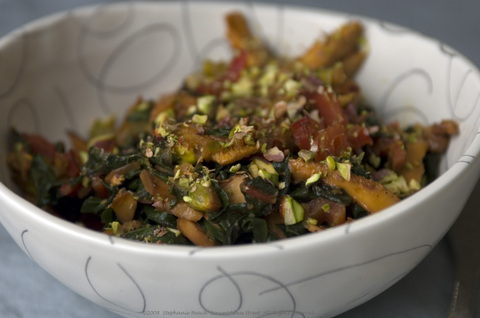 This is my "Rainbow Chard and Golden Chanterelle Mushroom Sauté with Chile-Lemon Pistachios." The gorgeous Rainbow Chard is grown all over California in various counties and easy to find this time of year. While my photo here doesn't show all the colors, it's called rainbow chard because each of the stalks are a powerful hue of red, orange, yellow, pink or white. Each stalk has only one color, but in a bundle they look just beautiful. While I was tempted to make a gorgeous tabletop bouquet of them, I decided to devour them instead. 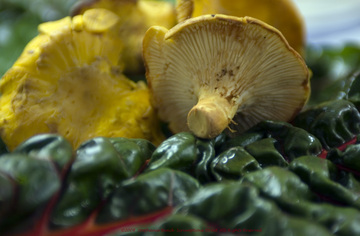 The Golden Chanterelle Mushrooms are also stunning and still available fresh along the northern California coast. Lucky for me! Usually the fresh ones are done by now, but I'm assured these are grown and harvested within the state. The last incredible ingredient in this dish is Chile-Lemon Pistachios from San Joaquin Valley Farms. I drove through this adorable agricultural belt just two weeks ago on my way to a great skiing weekend. Almonds and walnuts are also great products grown in the Valley. These pistachios are delicious, crunchy and fresh (not that STALE taste you get from many others) and are absolutely addictive covered in this hot chile-lemon spice rub. Wow. It takes all my self control when I'm craving a snack to limit to just one handful! So, these beautiful California ingredients came together in a lovely side dish that is fresh, mostly local and extremely healthy. Don't forget all those anti-oxidants, vitamins and protein. 1. Heat a large skillet with olive oil on medium-high and add the chard stems and shallots. Sauté until just tender about 4-5 mintues, then add the chard leaves. 2. Salt and pepper to taste and add the cayenne pepper. Stir to incorporate and continue sautéeing. Add the Chanterelles and toss together. 3. When the vegetables are tender yet still full of body, about 8-10 minutes, squeeze in the orange juice and turn off the flame of your burner. 4. 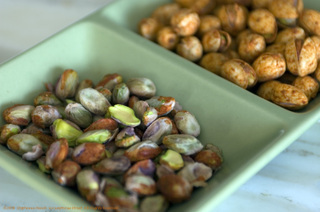 Toss in the chopped pistachios and gently stir together. Serve immediately and enjoy! I'm still no Barbara Kingsolver, but eating as close to home makes sense and is delicious when I'm living in this part of the world. Yes, I haven't posted much the past two weeks but that doesn't mean I'm not cooking! I've not had a moment to catch my breath and tell you my exciting news; I've started doing some part-time private meal service!! The past two weeks I've made a total of 8 two-dish meals and some desserts for a family here in the Bay Area. I'm loving it, having a great time, in fact. However, I simply cannot crank out so many meals, and keep track of recipes, photograph and blog. So, for now, here's a photo to show you how much food I"m producing. I LOVE cooking for people and getting paid for it... it's so wonderful, fun and rewarding!